Meet Linda! 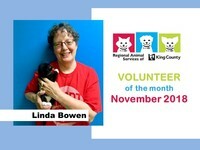 Linda Bowen is one of RASKC’s most extraordinary foster volunteers. For over 10 years, she has been going the extra mile so often. When Linda takes care of “bottle babies,” she feeds the kittens about every two hours- all night and all day. We cannot thank Linda enough for having contributed over 9,500 foster hours, not including the years prior to 2012. She contributed over 2,170 hours last year, plus over 1,000 foster hours in each of three other recent years. Linda is part of a caring cabal, including Becky Rubeck and Melody Johnson, who help each other with little ones in the greatest need of foster skills and love. Linda has also been absolutely stalwart in helping with RASKC rummage sales that funded the shelter’s catio and items in the cat-colony rooms. Thank you, Linda! Hurray for Cat Meet and Greet volunteer Vyrna Layton and television reporter Vanessa Misciagna for this video that was broadcast on KING 5 last month! 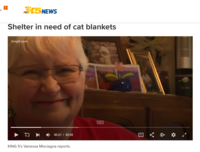 The RASKCAL Reporter had issued a call for volunteers to make and contribute cat cozy blankets. This appeal was posted to Patch.com, where it caught Vanessa’s attention. She contacted RASKC, and we connected her with Vyrna. As a result, RASKC has received a breathtaking number of cat blankets from the community. Thanks to all who made cat blankets, including Vyrna. She has contributed over 1,900 blankets since 2014. Vyrna was named Volunteer of the Month in October last year. Hurray for RASKC Dog Walker Emmy Murano! 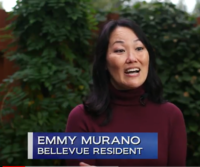 She and her dogs are featured in a new City of Bellevue video to promote pet licensing. The story was also included in the city’s monthly news magazine show, Lake to Lake. The City of Bellevue also just released a brief public service announcement to promote pet licensing. Did you know? Licensing your pet helps to fund the life-saving work that RASKC performs. Each year RASKC gives thousands of animals a second chance by providing quality care while at the shelter. More importantly, it protects your pet. Found pets with a tag can quickly be reunited with their owner. 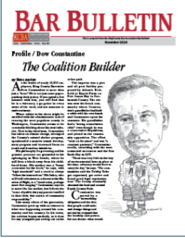 The King County Bar Association features a profile of King County Executive Dow Constantine in the current edition of its Bar Bulletin. In the second paragraph in the article, the RASKC revamp is mentioned as one of Executive Constantine’s top initiatives, along with addressing climate change, transit development, and increased focus on youth and homelessness initiatives. 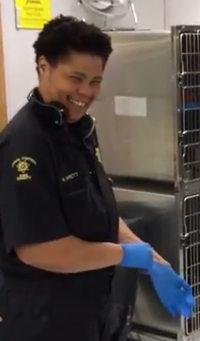 If you’ve been wondering why you haven’t seen Animal Care Technician Nileen Garrett, it is because she is currently working in a “special duty” assignment as the Call Center Specialist. Under the supervision of Kerri Sheehan, Nileen works with colleagues Dani Mudd and Aaron Siegrist. The call center is responsible for answering the PETS main line (206-296-7387). 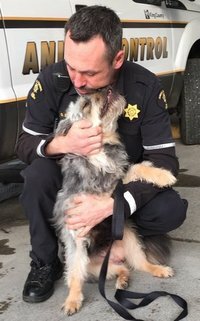 They work closely with the Animal Control Officers who respond to more than 5,000 calls each year in unincorporated King County and our 24 contract cities, covering nearly 1,100 square miles and a population of just over one million. RASKC staff that are currently on a special duty assignment: ACT Kate Cataldo and ACT Adryan Jones are both serving as Acting Shelter Sergeants; LVT Colleen Wayne is currently working with the Medical Examiner’s Office; Dr. Gene Mueller as the RALS Deputy Director; and Tim Anderson, as the RASKC Acting Manager. Meowtropolitan cat café rated top in the U.S.
Hoodline.com recently rated Seattle Meowtropolitan cat cafe as the best among 25 favorite themed- cafes in the United States. According to the article, “With a 4.5-star rating out of 222 reviews on Yelp, this cat-friendly café and adoption center is making waves with its selection of coffee drinks and Italian sodas paired with a separated cat lounge and large feline-viewing windows. “There’s a philanthropic component to the café’s mission as well- it partners with the Regional Animal Services of King County (RASKC) to help house cats looking for a forever home. 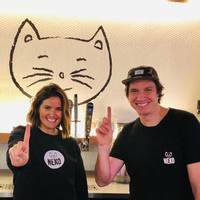 Additionally a portion of the proceeds from the café’s cat-themed merchandise are donated to a local shelter, rescue center, or charitable organization that works with animals. Kudos to our partners at NEKO cat cafe who have recently celebrated their one-year anniversary. NEKO, located in Seattle's Capitol Hill neighborhood, has been invaluable to RASKC, since they take in our FeLV cats. We are thankful to Caitlin and the staff for doing such an amazing job in caring for shelter cats. We’re so excited and proud to be working with such wonderful community members! Congratulations to Reber Ranch which won King County’s “Rural Small Business of the Year Award." Reber Ranch has continually hosted RASKC cats and kittens for adoption for more than 10 years. Whether it is a monetary gift, in-kind donation, personal volunteer time, or sharing your story, #GivingTuesday is widely recognized as the Global Day of Giving. Whether it is getting involved to support RASKC, or another animal organization, one of the best ways to support your community is to get involved. Thank you in advance for supporting and caring animals near and far. Animal Control Officer Steve Nickelson has been working for RASKC/ KCACC for 20 years. (RASKC was previously known as King County Animal Care and Control). He is one of the longest serving and one of the nicest people at RASKC. Why did you decide to work with animals? I have always been a dog person. Dog behavior has always interested me. 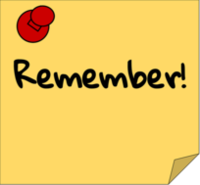 What did you do prior to coming to RASKC? When I was serving in the Army Reserves, I met a field sergeant who worked at the shelter. He encouraged me to apply. I had also applied to be a police officer in Kent. I am glad that I chose here. I’m in love with this job. What are the best parts of your job? I really enjoy talking with a lot of people in the community about dog behaviors. I also enjoy the work schedule of four days on and three days off. What do you do when you’re not at work? I like to go hiking, especially with my family. I also like to go mountain biking. Scooby is an eight year-old male Pit Bull (ID #A569060). He is a cool dude with a big personality. He loves tennis balls and thinks they are the best part about life! Food is also at the top of his “Awesome Things List.” Scooby is pretty friendly with everyone he meets. He may do better with older kids, since he is still working on his manners. Scooby would prefer to be the only animal in his new home, so he can get all of your love and attention. Scooby has a GREEN personality. He is adaptable and just goes with the flow. 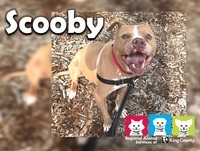 Scooby is an outgoing and carefree dude who just can't wait to find his forever home! Scooby is neutered, current on vaccinations and micro chipped. His $100 adoption fee includes a free visit to the veterinarian of your choice and 30 days of opt-in pet insurance through Trupanion. You may meet Scooby and other animals available for adoption every day, except major holidays, at RASKC's King County Pet Adoption Center in Kent, 21615 64th Ave S; Monday - Friday: 12 p.m - 6 p.m, Saturday - Sunday: 12 p.m - 5 p.m. Phone: 206-296-7387 (PETS), adoptapet@kingcounty.gov. RASKC will be closed to the public on Thanksgiving and the day after. 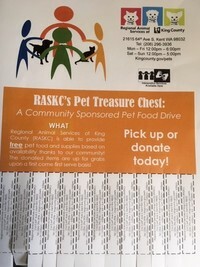 If you would like to promote RASKC’s Pet Treasure Chest by placing a poster at your favorite library, coffee house, or pet-supply store, email RASKC to request one or more posters. Anyone may donate pet food or supplies for our treasure chest. All items in the treasure chest are available for anyone in the community to take home. Thanks to Xerox! For the fifth consecutive year Xerox has donated $2,500 to RASKC, thanks to the efforts of Xerox employee Stephanie Potter and colleagues. Stephanie also made and donated cat cozy blankets too. Thanks to the Pet Loss Center! Earlier this month the new Pet Loss Center (cremation services) donated $500 to RASKC. This donation came to RASKC, because more volunteers from our shelter attended the Center’s Open House than any other group. Thank you Dawn Detweiler, Dawn Gerken, Marie Gerken, Roxie Rahl, and the other volunteers who attended the Open House! When in the Cat Adoptions Building at RASKC/Kent, we ask you to look at the condos in the bottom rows. With rare exceptions, the litterboxes should be in the upper shelf. When the litterboxes are in the proper spot, it makes cleaning a lot easier. Green Dog Walkers: If there are not enough "green" dogs during your shift, please help out with dog-enrichment activities. When it’s time to resign, please give at least two weeks’ notice. Because your presence is meaningful, we need as much time as possible to fill the position that you’re leaving. RASKC maintains more than 300 scheduled shifts; about 85% are weekly. To sign up for a shift, attend our New Volunteer Orientation in Kent or Kirkland to learn more. Note: If you are a RASKC volunteer and you do not see an opening that matches your availability, we appreciate your patience. Additional openings occur almost every week. Dog Walkers to assist 106.9fm DJ Heather for live streaming on Facebook @ RASKC/ Kent. Dog Walkers of any color are eligible. Contact Sarah L.
Wednesdays, 3pm- 5pm, alternating weeks.